If you like captivating photography, food, and accessories—particularly when all three are combined—you'll enjoy Fulvio Bonavia's portfolio. Take a look at his "A Matter of Taste" photographs in the "Work" section over here. I'm glad my shoes aren't made of food. As it is, I have enough trouble keeping my foot out of my mouth. This is amazingly beautiful! I can't believe the handbag. Hmmm... where have I seen those before??? I absolutely love his stuff! It is truly amazing! The purses are the best though! So cute! I really like the bag! haha these def. brought an immediate smile to my face. original! Those are so cool. Now I'm craving raspberry's. This is exceptional!! 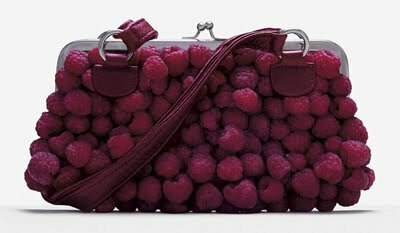 I want a raspberry purse of my own. I love that prosciutto ring! Your foot in the mouth comment was priceless - well done. Hi! Please check out my blog! Theree is a new challenge with a little prize! 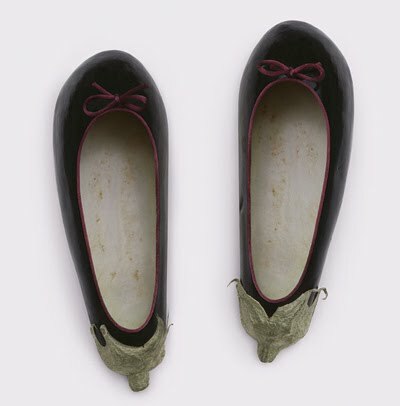 aubergine ballerina flats... awesome. thanks for sharing!! Wow, how marvelous! Love it! How supremely talented is Fulvio Bonavia - who would of thought to make a purse out of raspberries! Oh! I love the photos - I also love the food shoes. I have vegetable sandals that my boyfriend wants to burn. Will have to send you a photo. it's funny i looked at this post today because yesterday my friend linked me to an italian website with the same artist and these photographs. really beautiful stuff. Truly magnificent, I really like it.